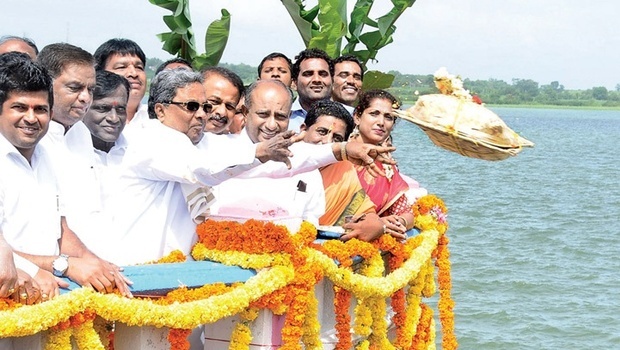 Karnataka chief minister Siddaramaiah on Sunday offered bagina to Kabini river to celebrate the reservoir reaching the maximum level in the month of June itself, for the first time in 12 years. Siddaramaiah is a happy man because Tamil Nadu chief minister J. Jayalalithaa will not ‘irritate’ him for the next one year on the Cauvery water sharing because all the reservoirs in the Cauvery basin are getting filled up due to unprecedented rains in Kodagu district (Coorg), the birthplace of Cauvery. Hence the people of Kodagu are known as the children of Cauvery. Since Cauvery’s children are politically insignificant and do not form a ‘vote bank’, Siddaramaiah did not bother to do an aerial survey of the rain-affected areas which he would have normally undertaken if the votes in the area mattered. Leave alone visiting Kodagu, the chief minister did not bother to gear up the Kodagu district official machinery which was caught unawares by the heavy downpour in the month of June itself, whereas in the past, the monsoon was spread over a few months. Consequently, there was heavy flooding all over Kodagu this time and due to the strong monsoon wind, trees had fallen all over the district, affecting the supply of power. The electric poles had fallen in most places, making the power supply situation worse. The most affected was the town of Virajpet, the second major town in Kodagu, where water supply was paralysed for nearly a week due to lack of power to pump the water. Chescom, the power distributing company in Kodagu, failed miserably in restoring the power supply. The situation still remains bad because most rural parts of Kodagu are yet to get back power. Residents of Kodagu are not able to charge their mobile phones in the absence of power supply. This has led to a breakdown in communication. The rain havoc in Kodagu has already claimed the lives of seven persons, including Cariappa, aged 40, who went missing on June 23 after his car was washed away in the floods and surfaced five days later after the floods subsided. The situation in Kodagu in the past week has demonstrated how Kodagu is only a colony for the politicians of Karnataka.